During pregnancy the uterus stretches which can cause the rectus abdominis muscles, that meet in the middle of the abdomen, to separate. A diastasis is the thinning and weakening of the connective tissue (linea alba) that connects the left and right sides of the rectus abdominis muscle. In mum terms, this can be a frustrating post baby tummy protrusion that won’t shift even when the baby weight is long gone! While this is not an everyday conversation, there is a strong chance that many of us actually have or have previously struggled with this condition. In fact 98% of women are said to have suffered with this condition post-delivery. While diastasis recti is most common in pregnant women men and children can also suffer as well. The condition is actually related to internal abdominal pressure which might occur post- surgery, an injury or more commonly, from exercising incorrectly with a lack of pelvic floor and abdominal connection. The main thing is not to despair as there are ways to help your diastasis. A lot of women believe performing endless crunches and sit ups post pregnancy will bring their flat tummy back but this can actually have a harmful affect and do quite the opposite. These exercises should be avoided until you are 100% sure that your abdominis are back together. In fact, performing such exercises when a diastasis is present can cause long term damage, and further complications such as hernias. Lift your head slightly off the floor as if to do a stomach crunch connecting your abdominals. Press down gently between your abs – if there is a gap here that is the diastasis. Perform these tests around your belly button (above, below) so you can measure if there is a gap in different places. Small separations can be helped at home with specific exercises, however very large separations are slightly more complicated and are best checked by a professional medic. Comprehensive movements such as squats are suitable to help strengthen the entire body with correct technique and posture. Along with this, exercises that help draw the abdominals back to the center will help strengthen and correct the diastasis. When exercising, firstly connect your Pelvic Floor. This is a zipping up sensation from your back passage to your front – along with the feeling of stopping pee! Once this is connected draw upwards and in. Exhale on the ‘action’ or challenging part of the exercise and recruit your abdominals by imagining a corset being pulled in around you, drawing into your center. This will help the abdominals to wrap around you and draw inwards. 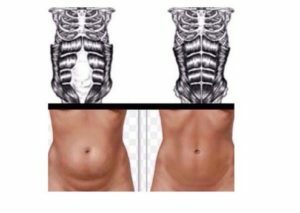 Look to have ribcage closure, this is were the ribs are softly drawn in and down towards your pelvis so your ribs float in alignment with the pelvis. Avoid extending the spine (bending your back) by flaring your ribs. Use your in breath when stationary or when you are able to maintain connection of your abdominals. Cat: Start in four point kneeling with a neutral spine and pelvis*. On your exhale, tuck your pelvis under using your core, lengthening your spine & pelvis into a c-shape. Avoid pushing into your mid back (bra strap area). Feel length between each vertebra. Return to start position and repeat 10 times. Wall Sit: Lean against a wall with your head, shoulder blades and sacrum (large bony part of spine above your coccyx) against the wall – in neutral spine and pelvis*. Connect your pelvic floor and abdominals and hold the position breathing slowly. Side Plank: Laying on your side, have a neutral spine and pelvis*, along with your shoulder and hips stacked over one another. Connect your pelvic floor and abdominals (remembering ribcage closure) and lift your hip off the floor, ensuring your hand is directly under your shoulder socket (you can lean on your elbow if preferred). Hold this position for 30 secs. Release and repeat 2-3 times on each side. Single Leg Slide: Start with a neutral spine and pelvis*. Exhale, connect your pelvic floor and abdominals and slide one leg along the floor maintaining a neutral posture throughout. On your next exhale draw the leg in (remembering ribcage closure). Repeat 5 x on each leg.